The Science Behind The World Cup Ball For every World Cup, there's a custom official ball. But how does the Telstar 18 actually stack up? To find out, scientists stuck it in a wind tunnel with a bunch of sensors. The Telstar 18 is the official match ball for the 2018 World Cup in Russia. Each World Cup, the sportswear giant Adidas designs an official ball to be used in the tournament. And small changes in the design can create significant differences in how the ball responds during play. "It's an interesting phenomena that the world's most popular sporting event for the world's most popular sport and the most important piece of equipment in that sport is changed every World Cup," says John Eric Goff, a physics professor at Lynchburg College in Virginia. The new ball is called the Telstar 18. It has six panels and a slick black-and-white design inspired by Russian cityscapes. It's meant to be a nod to a less technologically advanced predecessor, the Telstar ball used in the 1970 World Cup. But how does this ball actually stack up? To find out, scientists stuck it in a wind tunnel with a bunch of sensors attached to a metal rod. "It's actually recording the size of the forces on the ball," Goff says. The technology used in making the balls has changed significantly since that 1970 World Cup ball. Earlier Adidas models featured 32 panels stitched together, Goff says, but more recent models have fewer panels that are thermally bonded. And the changes have sometimes had what appear to be unintended effects on the physical properties of the official ball. For example, Goff points to "the dreaded 2010 Jabulani ball that was used in South Africa." The Jabulani was too smooth, which Goff says caused it to behave in ways that players sometimes weren't expecting. At some speeds during play, the ball would enter "drag crisis," he says. "The ball would stick like a beach ball," he says, with sudden swerves that outraged many goalkeepers. This video of a free-kick goal by Japan's Keisuke Honda is a good example of drag crisis. There's a slow motion replay at the 1:21 mark. The smoothness issue was basically fixed for the 2014 World Cup in Brazil. The Brazuca ball had longer seams joining its six panels – 68 percent longer, according to Goff's research. That roughened it up a bit and made it more predictable than the Jabulani. The Telstar 18, like the Brazuca, has six panels. And Goff says the seams are a little shallower and narrower than the previous ball, but the seam length is 30 percent longer. "I don't see that this ball is going to be so drastically different from the 2014 ball," he says. But there's at least one way that players might notice a difference. "The goalkeepers who like to kick the ball way down the pitch," Goff says, "are going to notice a slight difference in range compared to the 2014 ball" — about 8 or 9 percent. He teamed up with scientists from the University of Tsukuba in Japan, and their findings were recently published in the Journal of Sports Engineering and Technology. The Telstar 18 is also equipped with an electronic chip, which Adidas says fans and players can use to "unlock exclusive content." It's not clear what content that is, exactly — Adidas says it's "exclusive information about the product, adidas football content, special competitions and challenges, etc." However, the chip won't be tracking data about how the ball is used in play, according to the company. The technologically advanced ball is a far cry from those earlier balls with stitching, Goff says, which could actually get waterlogged and change the weight of the ball. 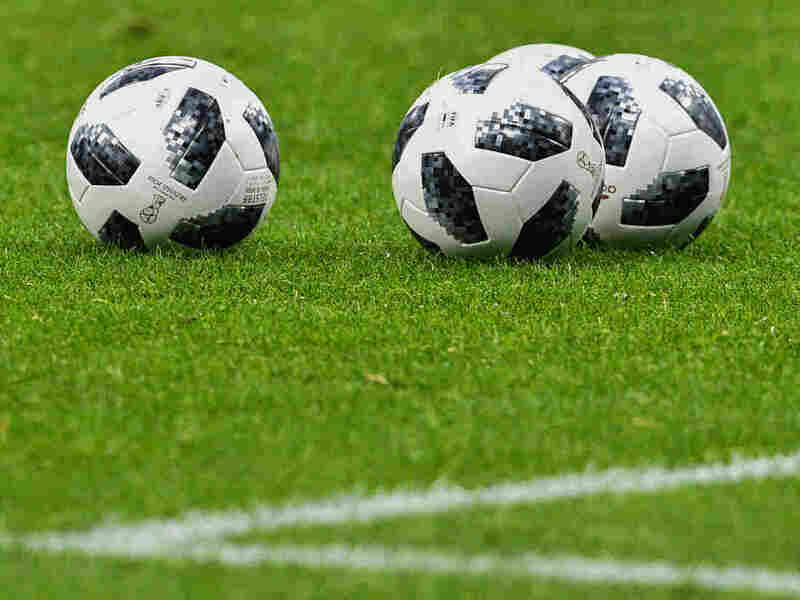 So why does Adidas change the ball for every World Cup? Goff says it's not really about physics — it's about money and marketing. Adidas is selling the official 2018 ball to the public for $124.